A new Mobile business will give crafters and do-it-yourselfers a new place to create their own custom-made accessories, gifts, and home décor. 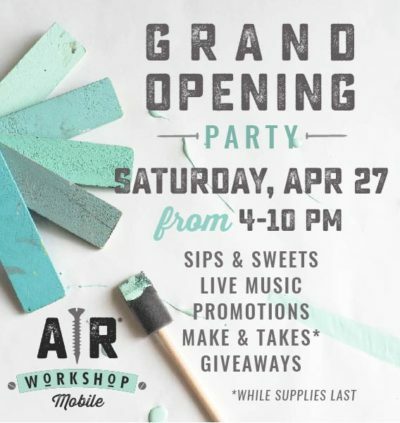 AR Workshop Mobile, a boutique DIY shop that hosts public and private instructor-led workshops, will open on Saturday, April 27, 2019, with a grand opening launch party at 4 p.m. – 10 p.m. at its location, 6601 Airport Boulevard, next to Montego’s restaurant. This shopping center at 6601 Airport Boulevard was originally developed in 2007. At the time, Starbucks occupied the space that is now known as Montego’s restaurant. The original developers sold the property to an investor which over-leveraged the acquisition through a Commercial Mortgage Backed Security (CMBS). The CMBS market was one of the contributing factors to the cause of the Great Recession. As a result, the property subsequently went into foreclosure. Because of Merrill P. Thomas Company, Inc.’s conservative investment principals, we were able to capitalize on the opportunity to purchase the property in 2013. Since our acquisition, the center has maintained healthy occupancy. 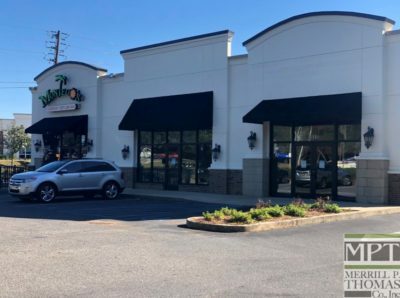 The property is situated on Airport Boulevard on an outparcel to Providence Hospital and is adjacent to the Walmart Neighborhood Market and Community Bank. 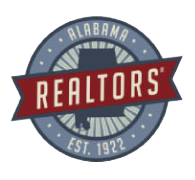 Tracy Weaver and her daughter, Courtney Rascoe, are the proud owners of AR Workshop Mobile, located in Mobile, Alabama. Tracy has experience in retail and has always had a love for all things crafty. She loves everything from baking to floral arrangements, but her favorites include sewing, embroidery, and jewelry making! Courtney has worked in business and accounting and is excited to be managing a business of her own. She recently discovered a talent and love for making hand-painted wooden signs and home decor. AR Workshop Mobile is the perfect fit for these two DIYers! 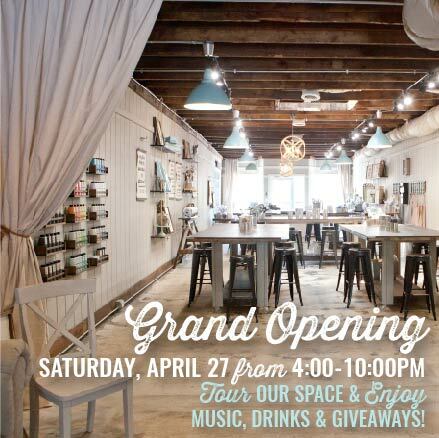 Come join us to celebrate the GRAND OPENING of AR Workshop Mobile! Tour our new workshop space! Giveaways and promotions running all night! We will raffle off 25 swag bags filled with lots of goodies to guests who have registered! We will have food, giveaways, raffles, and promotions throughout the event, (*while supplies last)! Click to REGISTER to attend the Grand Opening event! AR Workshop Mobile is a Boutique DIY Workshop that offers hands-on classes to create charming & custom decor, wood signs, canvas pillows and more! We also partner with local businesses for specialty classes and offer a variety of home decor items in our retail shop. Registration is open for the workshops and is available using the online calendar for public workshops or contact them to book a private event. The workshops are for all skill levels an AR Workshop Mobile will provide all of the materials, tools, and instruction. Register to come by yourself, with a group, or book a private party! Most of the adult projects range from $40-$70 and the youth projects range from $40-$45. Most workshops last from 2-3 hours, depending on the project. The Mobile shop is one of more than 100 AR Workshop locations, which feature rustic chic crafts. The business is the brainchild of founders Maureen Anders and Adria Ruff, who started their company as a blog and online shop in 2010. They started going beyond the internet more than two years ago and are opening stores across the country, according to AR Workshop’s website.